Tamil Nadu Government Conducting the Free Coaching Class for TNPSC, TNPSC Group 2, Group 4, SSC, IBPS, RRB and other competitive exam free coaching to educated youth for various competitive exams in Chennai, the eligible interested candidates submit Online Application on or before the last date 25.4.2019. 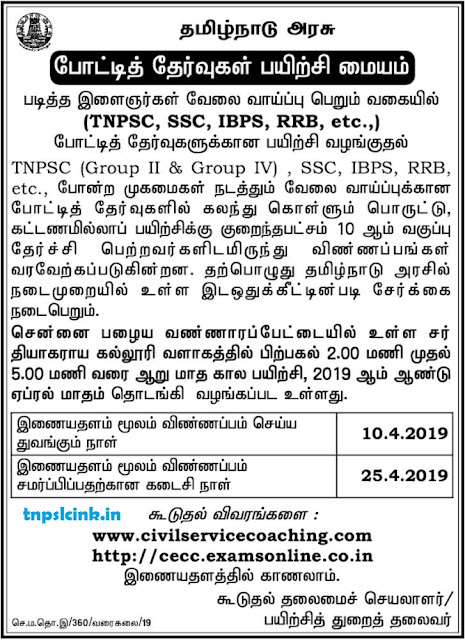 Apply Now through online for Tamil Nadu Competitive Examination Coaching Centre (CECC), the candidate has to visit the website www.civilservicecoaching.com. Last Date of Online Application Submission: 25.4.2019.